Obituary – Hatfield, Florence Irene (Pricer) « Perry High School Alumni Association, Inc.
– daughter of Mr. and Mrs. Harry K. Lamison has always attended the Perry schools. She is a member of the Journalism club and will attend the Wichita Business College next year. 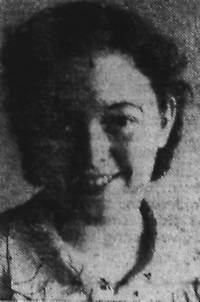 F. Irene Hatfield, 71, Klamath Falls, died Nov. 30, 1990 in Enid, Oklahoma. She was born August 4, 1919 to Columbus Edwin Pricer and Myra Hicks in Perry, Oklahoma. After graduating from Perry high school in 1938, she went to business school in Enid. She married George Hatfield in Klamath Falls in 1946. Mrs. Hatfield was a bookkeeper for various businesses for 16 years. She was a life member of Veterans of Foreign Wars Auxiliary Post No. 1383. She enjoyed hunting, fishing and the outdoors. Mrs. Hatfield is survived by her husband; brother and sister-in-law; and numerous nieces and nephews.